MYRTLE BEACH, South Carolina (CNN) -- After earning a reputation as a killer in Haiti, Tropical Storm Hanna amounted to little more than a windy rainstorm along the Atlantic Coast on Saturday. 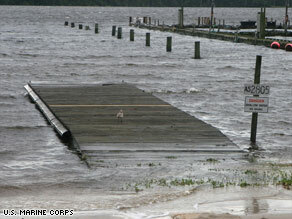 Water almost covers the dock at the Marine Corps Air Station marina near the New River in North Carolina. No states have "expressed any damage that they couldn't handle," said Glenn Cannon, the Federal Emergency Management Agency's assistant administrator for disaster operations. He said there were some concerns about flooding near rivers and in low-lying areas. "We're monitoring Hanna, but it seems to be a heavy rain event," he said. According to the Associated Press, Hanna did cause one death in a traffic accident on Interstate 95 in Maryland. Many people in Huntington, Virginia, about 8 miles northwest of Virginia Beach, voluntarily evacuated Saturday afternoon because of concerns about flooding, Fairfax County public information officer Merni Fitzgerald said. The area, which has flooded in the past, was receiving heavy rain, she said. She could not provide an exact number of people who had evacuated. The storm drenched the Carolinas and Virginia with heavy rain pushed by 55-mph winds as it zipped northward near 30 mph (48 kph), the National Hurricane Center reported at 11 p.m. ET Saturday. At that hour, the center of the storm was 90 miles (145 kilometers) west-southwest of Long Island, New York, and about 135 miles (220 kilometers) southwest of Providence, Rhode Island. Hanna would travel the coast all the way up to Canada's Maritime Provinces by Sunday night, forecasters said. Hanna came ashore at 3:20 a.m. ET near the North Carolina-South Carolina state line. It caused a surge of 1 to 2 feet of water along the shore and was expected to deliver 4 to 6 inches of rain, with some areas getting more. "It's actually going fairly well, with some reports of minor flooding," said South Carolina Emergency Management spokesman Derrec Becker. About 10,000 South Carolina homes were without power Saturday morning, mostly in the Myrtle Beach area, Becker said. He also said 444 South Carolina residents were staying in 15 shelters. No deaths were reported, flooding was limited, and no highways were closed, Van Sciver said. Nearly 1,500 residents sought refuge Saturday in 49 emergency shelters in North Carolina, Van Sciver said. The storm snarled some travel plans. It triggered delays for arrivals to Philadelphia International Airport in Pennsylvania and departures from Newark International Airport in New Jersey and John F. Kennedy International Airport in New York, the Federal Aviation Administration said. Delays at JFK airport averaged about four hours, the FAA said. Pounding waves flattened some sand dunes on the beaches at Oak Island, North Carolina, just east of the storm's landfall. The island's Ocean Crest pier, rebuilt after Hurricane Floyd destroyed it nine years ago, held up under Hanna, but the American flag flying above it was in tatters and barely attached to its pole by sunrise. By Saturday afternoon, the hurricane center had discontinued a tropical storm warning southward from Cape Hatteras, North Carolina. A tropical storm warning covered much of the East Coast from Cape Hatteras to Merrimack River, Massachusetts, about 31 miles north of Boston. The warning included all of Chesapeake Bay, Washington, New York Harbor and Long Island Sound, as well as popular vacation islands Martha's Vineyard, Block Island and Nantucket. The warning means tropical storm conditions are expected within the warning area within the next 24 hours. iReport.com: Are you getting soaked? Hanna caused severe flooding and killed at least 137 as it lingered for several days over and just off the coast of Haiti. U.N. relief supplies started arriving in the beleaguered country Friday, even as Hurricane Ike threatens to do even more damage. Ike will pass near or over the Turks and Caicos Islands, just north of Haiti, and the southeastern Bahamas in the next day, the hurricane center said. Ike's impact on the United States is less certain, but it could brush South Florida and hit the Gulf Coast as a major hurricane next week. iReport.com: "There's now a pond in my car"